A solid, low cost wheel! I've had this wheel for about 45 days and put about 400 miles on it (100 on gravel roads). The wheel has stayed true and is working perfectly. This is more of a preference but the hub is on the quiet side, an aspect I really appreciate. The wheel did not come with rim tape and after a couple of flats I spend $5 and installed it myself-cheep and easy but it seems like something that it should have come pre-installed. I love the fact that it is a Shimano hub and will be serviceable with parts that are easily accessible. I recently tired to replace the free-hub on a different low cost wheel and found the part nearly impossible to find. when that time comes. I will let you know after I purchase. 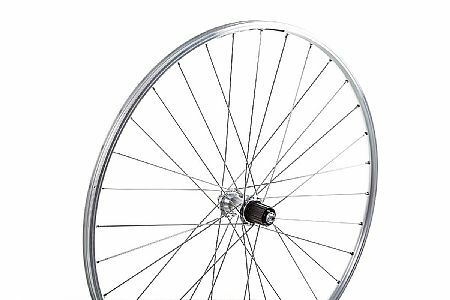 Seems like an ok wheel for really reasonable price.